Blue on blue - stunning! 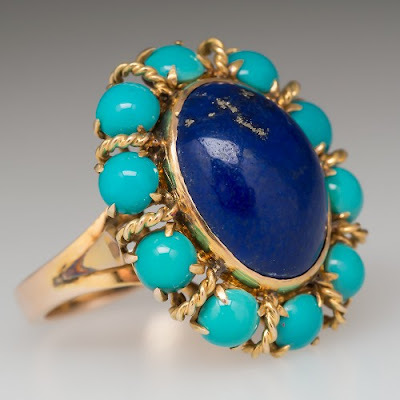 This gorgeous cocktail ring features a bezel set deep blue lapis lazuli cabochon surrounded by light blue turquoise half beads mounted in twisted yellow gold. This vintage ring features cathedral shoulders with a classically rendered wire work gallery underneath the stone. When it comes to celebrating the symbolism and meaning of December's birthstone, this ring is the perfect choice. For over 6,000 years, this deep blue gemstone has been mined around the globe, most prominently in Afghanistan, Pakistan, Siberia, Chile, and North America. As seen in the upper portion of this 10-carat cabochon, the lazurite that comprises the main bulk of lapis lazuli is often shot through with shimmering golden pyrite and other compound minerals, including calcite which appears white and sodalite which appears light blue. The mineral compound called lapis is found most often in crystalline marble, where heat has caused the lazurite to intrude upon the marble. Imagine yourself standing on a desert hillside where bulldozers cut away at the soil, exposing giant slabs of brilliant blue all around you. It must be so magical to be in the presence of raw lapis, particularly for those ancients who discovered the gemstone thousands of years ago. Because of its bright blue hue and its suitability for carving, lapis is one of the first recorded gemstones to be worn as jewelry. Ancient Egyptians used it to fashion their all-important seals, their version of the modern signature required to transact business. They also carved it into sacred vessels, vases, and sculpted figurines. Its color invoked the essence of divinity, inviting its association with the gods, royalty, power, and spiritual insight. Ancient Persians and pre-Colombian societies, as well as Europeans during the Middle Ages, revered lapis lazuli for its representation of the starry evening sky, and in the Orient it was relied upon for protection from the evil eye. It has been hailed throughout history as a stone of truth, wisdom, and recompense for sin. The Ancient Egyptians also ground it down to use for eye makeup, a precursor to its use by Middle Age artists as the foundation for the first Ultramine blue paint used to capture the color of sky and sea. Ancient Romans ground it into powder which they mixed into their drinks as an aphrodisiac. Lapis lazuli can be seen in art the world over, from the mosaics of the Middle East and Africa, to paintings in Europe, to body ornamentation in cosmetics and jewelry across the continents. Through the ages it has retained its symbolic meaning as a stone of wisdom and truth, believed to promote insight and even psychic ability. It is believed by crystal healers to stimulate the higher mind, elevating the thinking centers of the brain and enhancing the intellect. Thereby, it is a stone of learning, believed to spark a thirst for knowledge, truth, and understanding. It is also a stone of truth, known to promote honesty and harmony in relationships. It brings about a clarity about oneself and aids a person in acceptance of her strengths and weaknesses. It is a stone of communication, believed to aid both writers and speakers in broadcasting their messages with clarity and authenticity. Finally, lapis lazuli is believed to be a stone of joy, evoking positive feelings and thoughts. As such, it may bring a level of tranquility and peace to the person who wears it. Optimism and hope are the key to peace, after all. It is the stone of friendship, believed to strengthen the bonds of love and fidelity, inviting a deeper level of intimacy. This makes lapis lazuli jewelry the perfect choice for the special person in your life born in December, be it a dear friend, a lover, or your brother or sister. We'd love to show this ring to you, as well as our other lapis lazuli jewels, and allow you experience the beauty and tranquility of this ancient stone for yourself. Call today to schedule a visit to our Bellevue showroom.